Cell journal publishes a paper "Mammalian Near-Infrared Image Vision through Injectable and Self-Powered Retinal Nanoantennae" by Yuqian Ma, Jin Bao, Yuanwei Zhang, Zhanjun Li, Xiangyu Zhou, Changlin Wan, Ling Huang, Yang Zhao, Gang Han, and Tian Xue from University of Science and Technology of China, Hefei, Anhui, Chinese Academy of Sciences, and University of Massachusetts. "Mammals cannot see light over 700 nm in wavelength. This limitation is due to the physical thermodynamic properties of the photon-detecting opsins. However, the detection of naturally invisible near-infrared (NIR) light is a desirable ability. To break this limitation, we developed ocular injectable photoreceptor-binding upconversion nanoparticles (pbUCNPs). 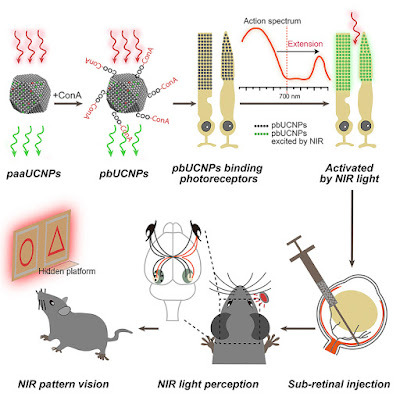 These nanoparticles anchored on retinal photoreceptors as miniature NIR light transducers to create NIR light image vision with negligible side effects. Based on single-photoreceptor recordings, electroretinograms, cortical recordings, and visual behavioral tests, we demonstrated that mice with these nanoantennae could not only perceive NIR light, but also see NIR light patterns. Excitingly, the injected mice were also able to differentiate sophisticated NIR shape patterns. Moreover, the NIR light pattern vision was ambient-daylight compatible and existed in parallel with native daylight vision. This new method will provide unmatched opportunities for a wide variety of emerging bio-integrated nanodevice designs and applications." This is very interesting but the things we do to sentient creatures in the name of science makes me think about the morality of such experiments. I hope that in 100 years we reach a stage of scientific enlightenment with respect to biology that such experiments are no longer pursued. Antoine Béchamp would approve. A prolific experimenter who refused to test on animals as he thought it an abhorrent practice. Also first scientist to discover bacteria, Louis Pasteur apparently plagiarized a lot of his work. Though it is highly predictable to see such stereotype from a brainwashed mind, I still feel fairy disgusted. Eidtor, please remove such kind of comments, if this is still a forum for technology. Thanks. None the less, I'm sorry if you perceived my comment as offensive. I admit that it is inappropriate, maybe stupid, for the main author taunting about potential applications in military operations (as we don't expect Einstein to brag his energy mass equivalence on atomic bomb application). While I don't believe such fundamental research is backed up by PLA, as in the acknowledgements we see "NIH (R01MH103133 to G.H. ), a UMass OTCV award, a Worcester Foundation Mel Cutler Award to G.H., and the Human Frontier Science Program (RGY-0090/2014)." If by any chance it does find way to soldier's eyes, it is not limited to Chinese soldiers, that's where comes the word "stereotype". I don't want to turn this topic into a heated discussion, so let's stop here.